Summer temperature 2018 – the ‘new normal’? The Met Office Chief Scientist, Professor Stephen Belcher, appeared on BBC Newsnight on Tuesday evening to talk about current extreme temperatures and climate change. The interviewer Emily Maitlis asked if the current hot temperatures we are seeing can be considered the ‘new normal’. Certainly, there can be no doubt that the summer of 2018 has been remarkable both in the UK and across the world. Professor Brian Hoskins, Chair of the Grantham Institute, Imperial College, and of University of Reading, spoke on the BBC World Tonight on Tuesday and also spoke about the links between the current heat wave and climate change. Here Stephen and Brian give a perspective on the heat wave and its connections to climate change. In the UK the hot weather has been with us on and off since April. Some parts of East Anglia and southeast England have had virtually no rain in more than 55 days, and we may see our all time highest temperature record of 38.5C fall by the end of this week. The Arctic Circle has seen temperatures top 30C, including at Badufoss and Makkaur in Norway, and in Finland temperatures have hit 33.4C. Meanwhile in Japan on Monday, the city of Kumagaya reported a new record temperature for the country, 41.1C, and temperatures have exceeded 40C in central Tokyo for the first time ever and there have been reports of many people being taken sick with heat stroke. Naturally people are asking whether this is a result of climate change – is this the ‘new normal’. So what can we say? Well, the atmospheric patterns leading to the UK heat wave do occur in the natural cycles in the weather, but they have been unusually persistent. The jet stream has weakened and got stuck to the north of the UK, with high pressure settled over the UK and Europe. In the summer such a pattern leads to dry soils, which means that if the sunny weather continues the energy of the sun is not used up in evaporating water and the temperatures rise even more. In addition, we’ve seen a background of global warming due mostly to increased atmospheric greenhouse gases, with global mean temperatures rising more than 1C above pre-industrial levels, and even more so over the northern continents. The natural cycles of weather mean that we shouldn’t expect heatwaves like this to happen every year but, when we do experience them, the warmer world means that there is an increased risk of even higher temperatures. 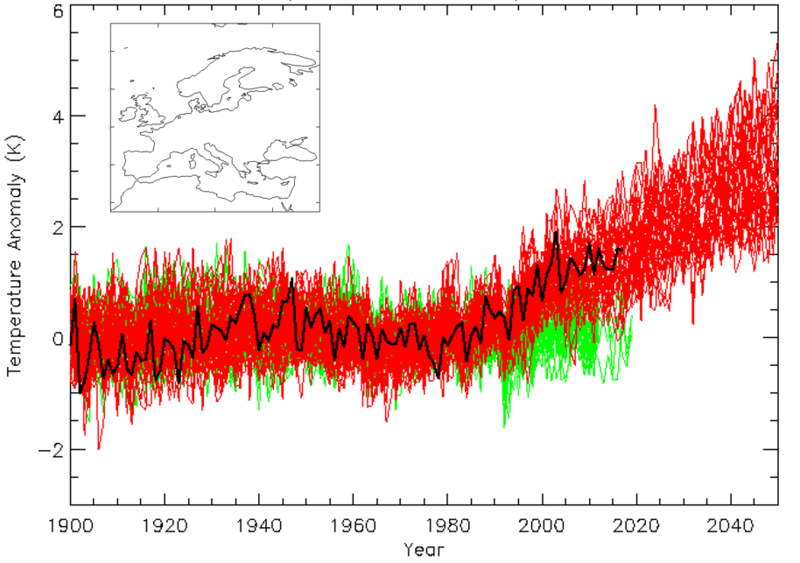 In 2003 Europe also experienced a pronounced heat wave. Research led at the Met Office showed that greenhouse gas concentrations in the atmosphere doubled the chance of the temperatures recorded in 2003 compared to what we’d expect in a pre-industrial world. This research also concluded that by the 2040’s the temperatures we saw in Europe in 2003 could be fairly normal in summer. We have updated this prediction with more recent data, and found that this prediction is still on track: the extreme temperatures we saw in the summer of 2003 can be expected to occur more regularly in Europe by the 2040s. At the Met Office, in collaboration with the Universities, we are carrying out a detailed analysis of this particular heatwave and its expression in a warming world. We’re aiming to understand why the weather pattern this summer was so persistent, and to what extent this persistence may be influenced by human-induced climate change, as well as the role of global warming by greenhouse gases in raising the temperatures experienced in the heat wave. We’ll publish our findings later in the year. The temperatures we are currently experiencing may not yet be the ‘new normal’, but within a few decades they could be. This entry was posted in Met Office in the Media, Met Office News and tagged 2018 summer, Arctic, climate, climate change, climate science, CMIP5, CRUTEM4, global temperatures, global warming, Grantham Institute, heatwave, Imperial College London, Japan, Japan temperatures, Jet stream, Met Office, Met Office Hadley Centre, Professor Brian Hoskins, Professor Stephen Belcher, record, UK heatwave, Universty of Reading. Bookmark the permalink. 5 Responses to Summer temperature 2018 – the ‘new normal’? This is a most interesting post with a clear direction of travel to put into perspective current weather in the UK and globally. I will requote these words as I think they are most pertinent in any discussions surrounding climate change. This single action as well as encouraging global birth control/population degrowth would benefit all our wildlife as well as humanity, so why are not pressing for this at speed. Tony, if we stop emitting greenhouse gases there will be some time for the earth system to reach a new equilibrium and so the temperature at that point (the ‘transient’ response to increased greenhouse gases) may be something like 70% of the eventual warming (the ‘equilibrium’ response). It doesn’t change you argument that we need to to get to zero ASAP, but maybe sooner than many people think. Hi Richard. Firstly, why address your ‘correction’ to Tony when the sentence you feel is in error is a direct quote from the Met Office post? Why not direct your question to the Met Office team who compiled the information and ask them to confirm the statement or to correct it? I fully understand your stance in pointing out that, according to the basics of this ‘settled science’, the blanket of ‘greenhouse gases’ produces and sustains a flux imbalance that, because of thermal storage oscillator lag, means that the surface of the Earth is not in phase with the radiative forcing. Hence, when a forcing is applied the final equilibrium temperature settles out decades, perhaps centuries later. This is the basis of your protest, is it not? However, this theory is not supported by the data, as monitoring of top of atmosphere radiative fluxes indicates that the systems ability to radiate is not impaired by the additional ‘greenhouse gases’. As the Earth’s temperature rises and falls the emissions to space rise and fall in phase with the temperature variation. Also, regularly, when surface temperatures measure warm the system exhibits negative net fluxes such that the Earth loses more energy than it receives, and this increase in top of atmosphere to space radiation occurs in ‘greenhouse gas’ emission bands. This data is in conflict with your protestation to the level where one of then has to be wrong. With respect I would declare that the data confirms that the atmosphere does not respond to enhanced levels of ‘greenhouse gases’ in the accepted manner (the mechanism you have proposed) in that increasing the atmosphere’s ability to radiate to space does not trap heat, as any surface warming is directly offset by an increase in the system’s ability to lose energy to space, as blue sky emissivity is enhanced. Temperatures fluctuate up and down relative to the recent average. Why is that only hot fluctuations are described as “the new normal”? We won’t know for many years whether or not the recent average has changed.